Special Containment Procedures: Worldwide news sources are monitored for events matching the pattern of SCP-2549. In the event of an SCP-2549 incident, elements of MTF Gamma-5 will be mobilized to the location. Any mention of the anomalous circumstances of the incident will be censored from the media, and any non-Foundation witnesses will be administered amnestics and given false memories matching the cover story provided to the media. To prevent a pattern from being established, the cover story for an SCP-2549 incident should not involve an animal attack unless no other explanation is practical. The SCP-2549-1 involved in an incident is not anomalous and is not a priority for capture. If it has already been captured, it may be surrendered to animal control or euthanized and disposed of. SCP-2549-2 is stored in the Temporal Anomaly subdivision of Site-77. Testing is disallowed by O5 order. Description: SCP-2549 is a phenomenon which affects one human being and one wild animal per incident. The exact criteria for the human subject is unclear, but it appears to invariably target those who have achieved great personal and/or professional success. Notably, an abnormally high percentage of the targets have been Foundation employees or have had contact with the Foundation. This has included 2 individuals once considered for D-Class induction, 3 potential agent and researcher candidates, 6 high ranking researchers, 2 executive administrators, [REDACTED]. The animal, referred to as SCP-2549-1, is an otherwise normal member of the order Carnivora which is native to the area of the human target. It is not known whether SCP-2549-1 is chosen from existing nearby animals, teleported to the area, or generated nearby. There is no record of a GPS tracked animal being chosen as SCP-2549-1. SCP-2549-1 will proceed towards the target at a walking pace. It will navigate any obstacles, displaying a knowledge of landscape, building layout, and security measures in order to find the shortest path. Security systems will not malfunction, but will be bypassed through mundane means. Any physical implements necessary will be carried by SCP-2549-1 in its jaws or in a clothing item. Humans other than the target will react to SCP-2549-1 without surprise, and may interact with it as if it is an acquaintance, coworker, or relative. SCP-2549-1 will respond to interaction in as much of a capacity as it can. At no point will any person attempt to interfere with SCP-2549-1's progress towards the target. Upon reaching the target, SCP-2549-1 will attack and begin to devour them. The target may remain alive and conscious for an extended period of time, but will make no attempt to resist SCP-2549-1. Upon the target's death, the anomalous effect ends. At this point, individuals not previously exposed to SCP-2549-1 will react as expected to the situation. Those previously exposed to SCP-2549-1 will react normally once given an opportunity to recognize the incongruence of the situation. SCP-2549-1 may lose interest and wander away or become agitated and attack other humans in the area, but all investigation has shown it to be nonanomalous after the death of the target. SCP-2549-2 is a 10cm diameter steel sphere. [DATA EXPUNGED] See Addendum 2549-A. Notes: Target was well known high roller. Became wealthy through well timed investment in ███ stock. Death occurred on main casino floor. Largest recorded exposure; all witnesses identified and handled. Notes: Target had been a Foundation agent candidate in 1936, after which he had a decorated naval officer career. Submarine performed an unscheduled surfacing to allow SCP-2549-1 entrance. Ship crew identified SCP-2549-1 as CPO S. O. Vadas. Notes: Target had been evaluated for D-Class status in 1963, then was released on parole. Owner of soup kitchen. SCP-2549-1 acquired and consumed a bowl of soup, then pierced target's skull with canine teeth causing instant death. Subsequently startled by crowd and escaped. Notes: Target was small time criminal, became notorious crime boss after assassinating and deposing previous kingpin. Due to small relative size of SCP-2549-1, attack was prolonged to approximately 15 hours. Multiple shifts of security guards ignored the assault. Witnesses identified SCP-2549-1 as target's lieutenant, Timon M. Vadas. Notes: Target left police force in 1947 due to stress, subsequently reconciled with estranged spouse. SCP-2549-1 consumed target unusually slowly, incident continued until death 3 days later. Spouse identified SCP-2549-1 as grandson Willy Edgar Vadas. Posthumous package received from target. See Addendum 2549-A. Notes: Requested retirement in 1995. After withdrawing request, made research breakthrough earning promotion to lead researcher. For details of death, see Incident Log 2549-79. Notes: Target was successful Foundation researcher candidate in 1954, but declined position. Spouse was prospective agent, met during same Foundation recruitment exercise. After rejection, target had successful academic career. The following log includes all pertinent information captured by security footage during this incident. The Foundation security badge used by SCP-2549-1 to access Lab-██. SCP-2549-1 approaches Site-██ vehicle access gate. SCP-2549-1 proceeds under the gate without incident. The 3 gate guards do not noticeably react. Guard Stevens: Good morning Dr. Vadas. Late again, huh? Guard Stevens: I understand. You'll have to fill out Form 83-A again, though. You know how it goes. The guard provides the required form and a pen. SCP-2549-1 hops onto the counter. Guard Stevens: I hope Johnny feels better soon. Are those antibiotics helping at all? SCP-2549-1 grips the pen in its jaws, breaking it and spilling ink over the document and countertop. It then dips a paw into a pool of ink and spreads more ink onto the form, shredding the form and damaging the countertop. Guard Stevens: Yah, I hear you. Middle school can be tough. She'll handle it, though. Anyway, glad to hear about Johnny. Have a nice day. The guard opens the outer security door and SCP-2549-1 continues. SCP-2549-1 passes Drs. Drake and Lindholm in the hall. Dr. Drake: [Laughs] You know it! SCP-2549-1 continues to Lab-██. It removes its badge (pictured) from its lab coat with its teeth, and proceeds to climb the doorframe. The badge is scanned, opening the door. Lead Researcher Taylor and Junior Researcher Longstaff turn to face SCP-2549-1 as it enters the lab and approaches Lead Researcher Taylor. Dr. Taylor: I deserve this. Dr. Longstaff: You deserve this. Dr. Taylor: I have lived this life. The price is paid. Dr. Longstaff turns back to his work. SCP-2549-1 attacks Dr. Taylor, disemboweling him. Target falls to the floor in apparent shock. SCP-2549-1 begins to devour target's entrails, eliciting screams. Dr. Longstaff does not respond. Approximately 3 minutes later, Dr. Taylor's screams fade in intensity and his vital signs alarm is triggered. It is deactivated by Guard Donahue with the note "FALSE ALARM Dr Vadas eating lunch again." Approximately 2 minutes later Dr. Taylor expires. Vital signs alarm is triggered again. 14 seconds later Guards Donahue and Franklin enter the lab and neutralize SCP-2549-1. Dr. Longstaff turns around in surprise. Dr. Longstaff: Oh my Lord, you shot Dr. Vadas! After the incident, personnel removed all references to Dr. Vadas from security and employment databases. Employment database contained no details beyond employment of SCP-2549-1, and all existing entries had been created at the start of the incident. 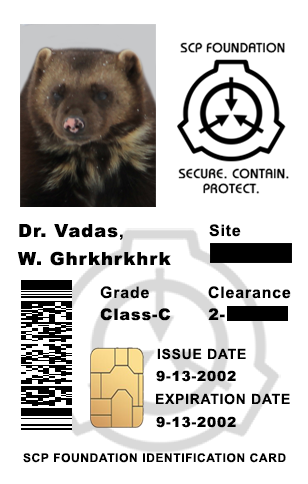 Those exposed to SCP-2549-1 clearly remembered the encounter, but memory of SCP-2549-1 itself was limited to superficial facts: that there was an employee named Dr. Vadas, his son was ill and his daughter in middle school, and he was a wolverine. This did not cause any cognitive dissonance until recalled after the event. Dr. Longstaff could not answer why he stated Dr. Taylor deserved to be targeted. While there is no record of Incident 2549-65 target Bradley S. Thompson being a Foundation agent, all signs and countersigns were current and accurate. In light of this and the date of the package, SCP-2549-2 has been identified as a retrocausal hazard. Documentation is sealed and the item is to be placed in permanent storage by order of O5-██. Your concern is well-founded Director. It is good you brought this to my attention. I am less concerned than you about the potential impact to the Foundation. While it is clear the anomaly has claimed a number of valuable personnel and will continue to do so, it is also clear that it would be difficult to predict and impossible to mitigate this effect. Fortunately, we can now discount SCP-2549 as a targeted attack on the Foundation, and the pattern you have pointed out indicates it has not decreased and, in some cases, has increased the effectiveness of Foundation assets, in both the past and the future. You cannot be aware of the extent to which O5-█'s actions benefitted your site and you personally, prior to their demise. Meanwhile, we cannot discount the possibility of a compulsion to seek the aid of SCP-2549, and regardless, the promise of a happier, more successful life may have a corrupting influence despite the price that is exacted. More importantly, it is clear that any testing of the item that has come into your possession will result in a containment breach and, considering the reward provided to Agent Thompson for his perseverance in returning it to our custody, it may prove impossible to reacquire. You have my approval to proceed with your plan of action regarding SCP-2549. As always, thank you for your dedication. It does not go unnoticed.